A Polish Problem: OPI Excuse Moi! Today, I have for you a polish from OPI's 2011 holiday Muppets collection, which unfortunately, I never got around to reviewing. This is 3 coats of OPI Excuse Moi with 2 coats of Nubar Diamont topcoat. Excuse Moi! was one of the stand-outs of the Muppets collection, in my opinion. It's a warm pink semi-sheer base packed with glitter in about 500 colors. ;) Actually, I am seeing pink, purple, silver, yellow, and green, and there may be a few I am missing (you can get a good idea of the colors of glitter from my pinky nail in the second picture). The base is sheer, but buildable, and the coverage on the glitter on this was exceptional. You didn't have to go fishing in the bottle, which was very nice. It does dry very textured, so you will need a thick coat of topcoat, probably two, to even things out. I used Diamont, but any of the thicker, quick-dry coats will work. It also dries very quickly. I had nails that were dry before I even applied the topcoat. If you own OPI's glitters from the Absolutely Alice collection or from the fall 2010 holiday Burlesque collection, this one is very similar in formula. It's probably even more wearable because it has a colored base, and you don't have to apply the glitter as thick in order to completely cover your nail. 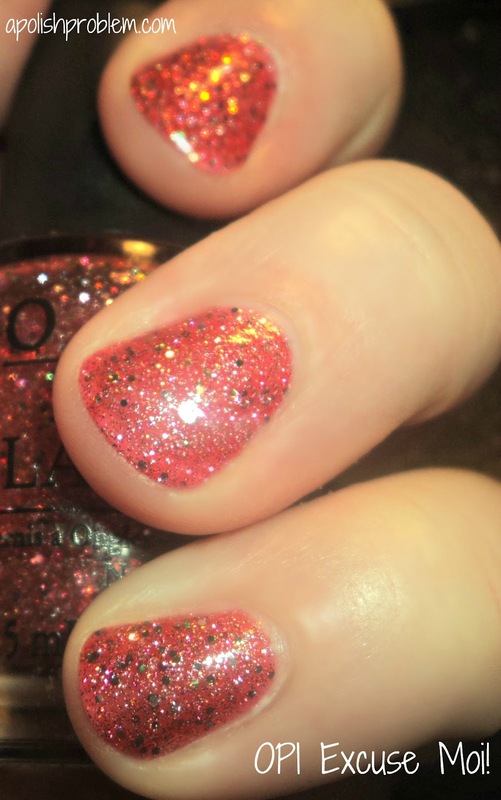 In case you are interested in picking this one up, I checked on OPI's website, and it looks like Excuse Moi! is still available. OPIs retail for $8.50 a bottle. I love this color it's so pretty!